Blog What Exactly Is Invisalign, and How Does It Work? Invisalign is popularly billed as “the clear alternative to braces.” Nearly invisible, this removable treatment option only needs to be worn for 20 to 22 hours per day, or as directed. Invisalign can be an excellent choice for adults as well as teens, yet many people are unsure exactly what to expect. Here is an overview of what Invisalign is, and how it works. Braces have long been the most popular treatment for crowded teeth, crooked teeth, overbites and underbites, among other orthodontic issues. However, they have quite a few drawbacks. Braces are comprised of metal and wires, which can cause irritation of the cheeks and gums. They can also demineralize the teeth, leaving behind dark spots and raising the risk for tooth decay. Braces are attached and adjusted solely by the dentist, and are in the mouth every moment for the entire duration of treatment. This makes it difficult to perform oral hygiene, and some foods are off limits. 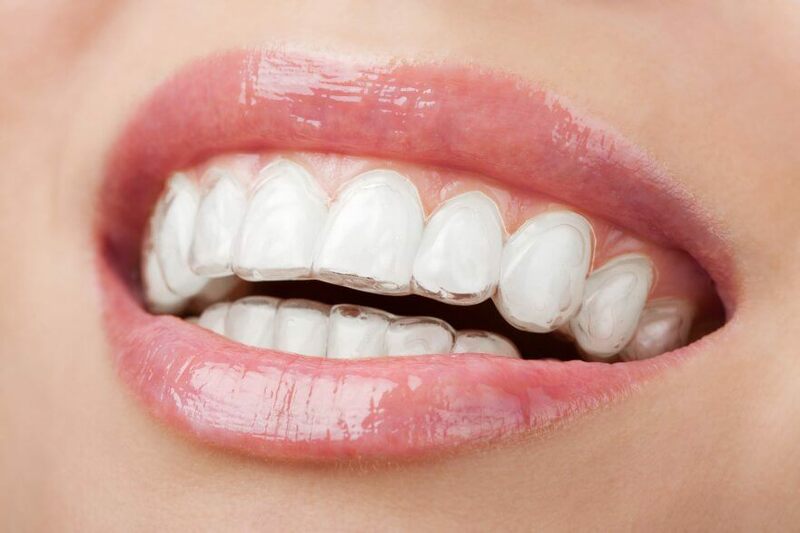 Invisalign aligners are made of clear, smooth plastic. There are no rough edges to irritate or cut the tissues of the mouth, and no wires to pop or break. To eat your favorite foods or brush and floss your teeth, you can simply pop out your aligners. In addition, Invisalign requires far fewer dentist visits, with most patients needing appointments only once every 4 to 6 weeks. Invisalign Teen includes sensors that let the dentist, as well as parents, know if their teenager is properly wearing the aligners. Invisalign Teen also provides six free replacement aligners to protect against loss or breakage. It is true that Invisalign may cost more than braces. However, this is starting to change. Invisalign pricing includes all dentist visits, and options such as colored metal can increase the price of braces. In addition, many dental insurance companies have begun to cover Invisalign. Talk to the office staff if you have any concerns over the price of Invisalign. The first step with Invisalign is a personalized treatment plan. Your dentist will take digital X-rays, photographs, and impressions of your teeth, and use the Invisalign software to create a 3-D model of your smile. This can then be digitally morphed to show you what to expect at each stage of treatment, including your final smile. If you already have braces and would like to switch, your braces will come off first. You will receive a plastic retainer to wear until your first set of aligners arrives in about two weeks. When your first set of aligners is ready, your dentist will attach small fasteners to your teeth to secure the aligners. It is normal to feel a bit of discomfort for a few days, but this is typically minimal compared to the pain of new braces. You will not need to make many changes to your lifestyle. You can simply take out your aligners to eat such foods as popcorn or apples, as well as to brush and floss your teeth. The biggest adjustment is simply remembering to put your aligners back in. It may be a smart idea to set a reminder on your phone the first few times, until it becomes second nature. You will change your aligners at home every two weeks or as directed. Each new set of aligners brings you one step closer to your new smile, so try not to forget to change them on time. Most people have little or no discomfort when adapting to a new set of aligners, because they are designed to fit your changing smile. Let your dentist know at your next appointment if you have any difficulties. You will not experience the “big reveal” that braces wearers have when the braces are removed, since Invisalign’s clear aligners let you see your smile every step of the way. Still, you will be able to move on with the confidence that comes with a terrific smile. You may need to wear a retainer for a period of time to prevent your teeth from shifting. If this is the case for you, be sure to wear it as directed to avoid undoing the effects of Invisalign.